Evaluation of the RAAPS Risk Screening Tool for Use in Detecting Adolescents With Depression Jennifer Salerno, DNP, CPNP, FAANP, and Sarah Barnhart, MPH Jennifer Salerno, DNP, CPNP, FAANP, is Director; Sarah Barnhart, MPH, is Research Assistant, University of Michigan, Ann Arbor, MI, USA. Search terms: Adolescent depression, depression questionnaires, preventive services, risk screening questionnaires, risk taking Author contact: [email protected], with a copy to the Editor: [email protected] Financial Disclosure: No external funding was secured for this study. Dr. Jennifer Salerno is the President of Possibilities for Change, the company offering license agreements for use of the web-based version of the RAAPS tool. The paper version is available for download at no cost at http://www.raaps.org Sarah Barnhart: No financial disclosures. PROBLEM: Screening is vital to quality adolescent care, but using multiple surveys to screen depression and interrelated risk behaviors is difficult. The aim of this study was to evaluate RAAPS (Rapid Assessment for Adolescent Preventive Services) effectiveness as a screening tool for adolescent depression. METHODS: Cronbach’s α, area under the receiver operating characteristic (ROC) curve, sensitivity, specificity, and positive and negative predictive values were assessed. FINDINGS: Cronbach’s α was 0.66 overall. The ROC curve is 0.86. Sensitivity and specificity were 0.86 and 0.71, respectively. The positive predictive value is 0.46 and the negative predictive value is 0.95. CONCLUSION: Results indicate RAAPS may be an effective screening tool for identifying adolescent depression. and have higher healthcare costs than their counterparts who had received services (Kataoka, Zhang, & Wells, 2002; U.S. Department of Health and Human Services New Freedom Commission on Mental Health, 2003). The Institute of Medicine states that mental health screening offers the potential to intervene early and prevent fully developed disorders (National Research Council (U.S.) and Institute of Medicine (U.S.) Committee on the Prevention of Mental Disorders and Substance Abuse Among Children, Youth, and Young Adults: Research Advances and Promising Interventions, 2009). Moreover, studies have shown that identification of mental health symptoms, improved access to mental health services, and provision of interventions before the onset of fully developed disorders offer the greatest cost-effective approach (National Research Council (U.S.) and Institute of Medicine (U.S.) Committee on the Prevention of Mental Disorders and Substance Abuse Among Children, Youth, and Young Adults: Research Advances and Promising Interventions, 2009; Sturm, 1997). National organizations have responded by recommending routine screening in primary care settings of adolescents for all risky behaviors including depression screening (Centers for Disease Control and Prevention, 2010; Maternal Child Journal of Child and Adolescent Psychiatric Nursing 27 (2014) 20–25 © 2013 Wiley Periodicals, Inc.
Health Bureau: Bright Futures, 2012; U.S. Preventive Services Task Force, 2012). An assessment of adolescent depression and contributing risky behaviors is vital in providing quality adolescent care, but using multiple surveys to provide effective screening is difficult and time consuming. In primary care settings, provision of adolescent preventive services that include screening for depression remains far below recommended levels (Halpern-Felsher et al., 2000; Irwin, Adams, Park, & Newacheck, 2009; Ma, Wang, & Stafford, 2005; Rand, Auinger, Klein, & Weitzman, 2005), with time noted as one of the biggest barriers (Cheng, DeWitt, Savageau, & O’Connor, 1999). Hence, a comprehensive, self-administered adolescent risk screening tool that has been validated to identify depressive symptoms is an attractive alternative. The American Academy of Pediatrics Task Force on Mental Health recommends primary care practices institute routine, periodic screening using validated instruments to identify adolescents with mental health symptoms (Foy, Kelleher, Laraque, & American Academy of Pediatrics Task Force on Mental Health, 2010). Universal depression screening for adolescents has been met with little resistance and has been well received and accepted by primary care providers (Zuckerbrot et al., 2007). Methods The aim of this study was to evaluate the criterion validity and internal reliability of the Rapid Assessment for Adolescent Preventive Services (RAAPS) as a screening tool for adolescent depression, thereby extending the use of the RAAPS to settings interested in both identifying adolescent depression and comorbid risky behaviors that may negatively impact mental health. The RAAPS is a 21-item adolescent risk screening tool developed to identify the risk behaviors contributing most to adolescent morbidity, mortality, and social problems (Yi, Martyn, Salerno, & Darling-Fisher, 2009). The RAAPS was developed to overcome barriers to risk screening, particularly the time it takes to administer and review standardized risk screening tools in clinical practice settings. The RAAPS has been recognized as a valid, time-efficient, and effective screening tool in identifying multiple risk behaviors in adolescents, with strengths reported as its concise format, ease of use, and ability to assess for major risks efficiently (Yi et al., 2009; Salerno, Marshall, & Picken, 2012). Face-, content-, and criterion-related validity and inter-rater and equivalence reliability for the RAAPS were established in a previous study (Salerno et al., 2012). This study focused specifically on the validity and internal reliability of the RAAPS as a tool to identify adolescent depression. During the development of the RAAPS screening tool, recommendations from national health organizations, relevant literature, and adolescent risk behavior statistics were Journal of Child and Adolescent Psychiatric Nursing 27 (2014) 20–25 © 2013 Wiley Periodicals, Inc.
• During the past month, did you often feel very sad or down as though you had nothing to look forward to? • Do you have any serious problems or worries at home or at school? • In the past 12 months, have you seriously thought about killing yourself, tried to kill yourself, or have you purposely cut, burned, or otherwise hurt yourself? PHQ-A scores of 11 or higher, the published cut point for identifying depression, were used to evaluate the sensitivity and specificity of the RAAPS depression screening questions noted above. A ROC curve was used to determine the overall accuracy of the RAAPS depression screening questions. Cronbach’s α was calculated to determine the internal reliability of the RAAPS. Results Based on the PHQ-A cut point of a score of 11 or higher, the true prevalence of depression risk was 22.0% (95% CI, 17.2– 26.9). Cronbach’s α demonstrated that all four questions had good internal consistency. The overall α was fair (0.66). The ROC curve demonstrated good accuracy (Figure 1). The area under the curve was 0.86 (95% CI, 0.81–0.90). The optimal cut point was determined to be two or more positive responses on the RAAPS questions based on the ROC curve. The number of affirmative responses to RAAPS questions is displayed in Table 2. The overall sensitivity was 85.7% (95% CI, 74.8–92.5) and the specificity was 71.3% (95% CI, 65.0– 76.9). Sensitivity and specificity for individual questions on RAAPS are displayed in Table 3. The positive predictive value is 45.8% (95% CI, 37.1–54.7) and the negative predictive value is 94.6% (95% CI, 90.0–97.3). Based on a cut point of two or more positive responses on the selected RAAPS items, the prevalence of depression risk was 41.3% (95% CI, 35.7– 47.0). Journal of Child and Adolescent Psychiatric Nursing 27 (2014) 20–25 © 2013 Wiley Periodicals, Inc.
During the past month, have you been threatened, teased, or hurt by someone (on the Internet, by text, or in person), or has anyone made you feel sad, unsafe, or afraid? In the past 12 months, have you seriously thought about killing yourself, tried to kill yourself, or have you purposely cut, burned, or otherwise hurt yourself? During the past month, did you often feel very sad or down, as though you had nothing to look forward to? Do you have any serious problems or worries at home or school? RAAPS, Rapid Assessment for Adolescent Preventive Services. Table 3. Sensitivity and Specificity RAAPS questions During the past month, have you been threatened, teased, or hurt by someone (on the Internet, by text, or in person), or has anyone made you feel sad, unsafe, or afraid? In the past 12 months, have you seriously thought about killing yourself, tried to kill yourself, or have you purposely cut, burned, or otherwise hurt yourself? During the past month, did you often feel very sad or down, as though you had nothing to look forward to? Do you have any serious problems or worries at home or school? Discussion The RAAPS risk screening tool was designed as a brief, timeefficient tool for use in identifying the risk behaviors contributing most to morbidity, mortality, and social problems in adolescents, and is intended to be used in a variety of settings serving adolescents (Salerno et al., 2012). In a previous study, the RAAPS proved to be a valid and reliable tool for screening risk behaviors contributing most to morbidity and mortality (Salerno et al., 2012). The RAAPS creates a unique opportunity for professionals to meet adolescent risk screening recommendations in a time-efficient and effective manner with less disruption in their organization’s work flow. This study used psychometric methods to evaluate the RAAPS as an effective screening tool to identify depressive symptoms in adolescents that would warrant further assessment. The Cronbach’s α analysis of the RAAPS depression screening questions demonstrated fair internal consistency at 0.66, and 0.7 is considered the cutoff for being acceptable Journal of Child and Adolescent Psychiatric Nursing 27 (2014) 20–25 © 2013 Wiley Periodicals, Inc.
(Nunnally, 1978); however, this was expected due to the small number of RAAPS depression screening questions in the analysis. Therefore, the lower α value should not be interpreted as strong evidence against internal consistency, and for a behavioral measure 0.66 could be considered reasonable. The ROC curve analysis revealed that the overall accuracy of the RAAPS depression screening questions is acceptable within our study population. The cut point of two or more positive responses on the RAAPS depression screening questions provides a relatively high degree of sensitivity and specificity. We prioritized higher sensitivity over specificity due to the importance of detecting high-risk mental health behaviors in adolescents and the low risks associated with detecting false positives. Additional screening for depression and/or brief assessment would be recommended for those adolescents with two or more positive responses to the RAAPS depression screening questions to determine whether a more comprehensive depression assessment with a treatment plan and referrals are appropriate. This study represents preliminary findings of the RAAPS as an adolescent depression screening tool. Validity and reliability of the RAAPS as a measure of adolescent depression were established. With multiple competing demands on health professionals, the RAAPS can assist adolescent serving professionals in identifying depressive symptoms that may require further assessment, treatment, and referral while simultaneously identifying interrelated risk behaviors such as substance use or unsafe sexual activities. Data obtained from quality tools can contribute to the efficient and appropriate use of limited resources and the eventual reduction in health risk behaviors (Kann, Brener, Warren, Collins, & Giovino, 2002). As this is a preliminary study, the limitations include the small sample size and limited diversity of the participants. Another important limitation of this study is that the PHQ-A was used as the gold standard for depression screening in adolescents. Although the PHQ-A has been validated as an effective screening tool for depression in the adolescent population, the true gold standard is clinician diagnosis. 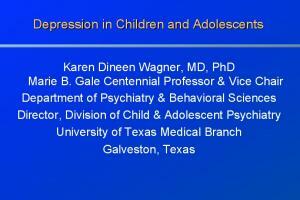 cation of depression and interrelated risky behaviors impacting adolescent mental health. Early identification allows health professionals the opportunity to provide adolescents with appropriate risk reduction counseling, further assessment, and resources that may positively impact their mental health. Primary mental health care is an essential role of the psychiatric mental health nurse practitioner (PMHNP). Although most PMHNPs work in psychiatric settings, primary care is evolving toward the integration of physical and mental health care, with PMHNPs beginning to provide mental health intervention in primary care settings. The RAAPS would be a useful initial screening tool for the PMHNP providing primary care to identify adolescents requiring a more comprehensive evaluation as well as identify concurrent risky behaviors affecting their mental health. Future research should focus on examining the RAAPS clinical impact on identifying depression and interrelated risk behaviors in adolescents with a larger, more diverse adolescent sample. Furthermore, process evaluation should be conducted on implementation of RAAPS into a primary care practice setting and examination of the effects on health professional time, patient/provider interaction, and the influence on positive behavior changes over time in adolescent patients. References Brown, L. K., Tolou-Shams, M., Lescano, C., Houck, C., Zeidman, J., Pugatch, D., & Lourie, K. J. (2006). Depressive symptoms as a predictor of sexual risk among African American adolescents and young adults. Journal of Adolescent Health, 39, 444-e1. Centers for Disease Control and Prevention. (2010). Youth risk behavior surveillance—United States, 2009. MMWR. Surveillance Summaries: Morbidity and Mortality Weekly Report. Surveillance Summaries, 59, 1–142. Cheng, T. L., DeWitt, T. G., Savageau, J. A., & O’Connor, K. G. (1999). Determinants of counseling in primary care pediatric practice: Physician attitudes about time, money, and health issues. Archives of Pediatrics and Adolescent Medicine, 153, 629–635. Elkington, K. S., Bauermeister, J. A., & Zimmerman, M. A. (2010). Psychological distress, substance use, and HIV/STI risk behaviors among youth. Journal of Youth and Adolescence, 39(5), 514–527. Foy, J. M., Kelleher, K. J., Laraque, D., & American Academy of Pediatrics Task Force on Mental Health. (2010). Enhancing pediatric mental health care: Strategies for preparing a primary care practice. Pediatrics, 125(Suppl. 3), S87–108. Halpern-Felsher, B. L., Ozer, E. M., Millstein, S. G., Wibbelsman, C. J., Fuster, C. D., Elster, A. B., & Irwin, C. E., Jr. (2000). Preventive services in a health maintenance organization: How well do pediatricians screen and educate adolescent patients? Archives of Pediatrics and Adolescent Medicine, 154, 173–179. Institute of Medicine (U.S.) and National Research Council (U.S.) Committee on the Science of Adolescence. (2011). The science of adolescent risk-taking workshop report. Washington, DC: The National Academies Press. Irwin, C. E., Jr, Adams, S. H., Park, M. J., & Newacheck, P. W. (2009). Preventive care for adolescents: Few get visits and fewer get services. Pediatrics, 123, e565–e572. Johnson, J. G., Harris, E. S., Spitzer, R. L., & Williams, J. B. (2002). The patient health questionnaire for adolescents: Validation of an instrument for the assessment of mental disorders among adolescent primary care patients. Journal of Adolescent Health, 30, 196–204. Kann, L., Brener, N. D., Warren, C. W., Collins, J. L., & Giovino, G. A. (2002). An assessment of the effect of data collection setting on the prevalence of health risk behaviors among adolescents. Journal of Adolescent Health, 31, 327–335. Kataoka, S. H., Zhang, L., & Wells, K. B. (2002). Unmet need for mental health care among U.S. children: Variation by ethnicity and insurance status. American Journal of Psychiatry, 159, 1548–1555. Kroenke, K., Spitzer, R. L., Williams, J. B., & Lowe, B. (2010). The Patient Health Questionnaire Somatic, Anxiety, and Depressive Symptom Scales: A systematic review. General Hospital Psychiatry, 32, 345–359. Ma, J., Wang, Y., & Stafford, R. S. (2005). U.S. adolescents receive suboptimal preventive counseling during ambulatory care. Journal of Adolescent Health, 36, 441e1–441e7. Maternal Child Health Bureau: Bright Futures. (2012). Guidelines for health supervision of infants, children and adolescents. Retrieved from http://brightfutures.aap.org/pdfs/Guidelines _PDF/18-Adolescence.pdf National Alliance to Advance Adolescent Health. (2011). Significant multiple risk behaviors among U.S. high school students: Fact sheet No. 8. Retrieved from http://www .thenationalalliance.org/pdfs/FS8.%20Significant% 20Multiple%20Risk%20Behaviors.pdf National Research Council (U.S.) and Institute of Medicine (U.S.) Committee on the Prevention of Mental Disorders and Substance Abuse Among Children, Youth, and Young Adults: Research Advances and Promising Interventions. (2009). Preventing mental, emotional, and behavioral disorders among young people: Progress and possibilities. Washington, DC: National Academies Press. Nunnally, J. C. (1978). Psychometric theory (2nd ed.). New York: McGraw Hill. Rand, C. M., Auinger, P., Klein, J. D., & Weitzman, M. (2005). Preventive counseling at adolescent ambulatory visits. Journal of Adolescent Health, 37, 87–93. Salerno, J., Marshall, V., & Picken, E. (2012). Rapid assessment for adolescent preventive services: Validity and reliability of the RAAPS adolescent risk screening tool. Manuscript accepted Journal of Adolescent Health, 50(6), 595–599. Sturm, R. (1997). How expensive is unlimited mental health care coverage under managed care? Journal of the American Medical Association, 278, 1533–1537. Journal of Child and Adolescent Psychiatric Nursing 27 (2014) 20–25 © 2013 Wiley Periodicals, Inc.
between depressive symptoms and patterns of substance use and risky sexual behavior among a nationally representative sample of U.S. adolescents. Archives of Women’s Mental Health, 9(3), 139–150. Yi, C. H., Martyn, K., Salerno, J., & Darling-Fisher, C. S. (2009). Development and clinical use of Rapid Assessment for Adolescent Preventive Services (RAAPS) questionnaire in school-based health centers. Journal of Pediatric Health Care, 23, 2–9. Zuckerbrot, R. A., Maxon, L., Pagar, D., Davies, M., Fisher, P. W., & Shaffer, D. (2007). Adolescent depression screening in primary care: Feasibility and acceptability. Pediatrics, 119, 101–108. Report "Evaluation of the RAAPS Risk Screening Tool for Use in Detecting Adolescents With Depression"